If you’re more of a scones-and-champers than mince-pie-and-mulled-wine type, the idea of a “festive” afternoon tea may not strike you as all that appealing but, with its fairytale-inspired offerings, Conrad London St. James has thrown tradition – along with food and drinkstuffs beginning with the letter m – out the window in favour of an altogether more radical approach to the festive menu. Eschewing the aforementioned festive fare, head pastry chef Zoe Wager has created an elegant, exquisitely presented menu inspired by Hans Christian Andersen’s tale of The Snow Queen, colluding with a bewitchingly presented blue-lit interior to cause those of us invited to preview the tea in advance of its launch to feel as though we might have stumbled into a fairytale palace ourselves. The soundtrack may nod to convention, but rest assured – pretty much any tune emanating from the nimble digits of a live harpist resounds with magic – if it’s atmosphere you’re after, Emmeline’s Lounge has it in spades (and shot glasses… and on sticks). 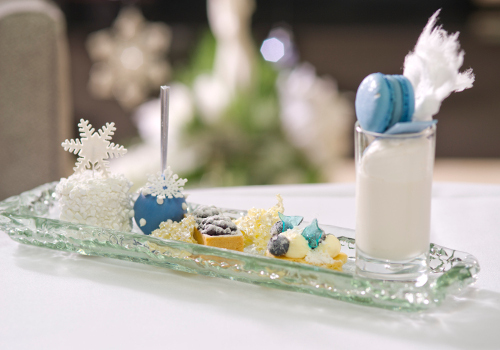 The Snow Queen Afternoon Tea is available at Emmeline’s Lounge, Conrad London St. James, 22-28 Broadway, London, SW1H 0BH, from 23rd November 2015 to 11th February 2016, priced at £39 per person, or £55 with free-flowing champagne. Book online, or call 020 3301 1400 to make a reservation. View the menu here. Posted in art and tagged food, food news, foodie. Bookmark the permalink.